This Week's TV: Watch a Clip from Futurama's Huge Series Finale! This week on television, we say a tear-filled farewell to Futurama — watch the first clip from the episode right here. Bubblegum Princess and Flame Princess have an explosive meeting on Adventure Time. Yay, it's a Bubblegum Princess-Flame Princess episode! Princess Bubblegum subjects Flame Princess to a series of tests to gauge Flame Princess’ fiery tendencies. But when there’s an emergency at the treehouse, and Princess Bubblegum leaves Cinnamon Bun to watch Flame Princess, her experiment might literally backfire in her face. Is it just me, or is Big Jim the only likable character on this show now, even though he's supposedly the villain? "Speak of the Devil" - Big Jim turns the town against Barbie when the truth about his past is revealed. Meanwhile, Maxine makes it personal when she confronts Barbie's closest ally. Also on TV tonight: There's a new Why Planes Crash on the Weather Channel at 9. Biography Channel has the first episode of a new show, Stalked by a Ghost, at 10 PM. The Writers Room on Sundance Channel is about American Horror Story, which ought to be interesting. That's also at 10 PM. Also at 10 PM: a new Siberia on NBC. First, "The girls create a Theme-ometer that turns real life into movies. Johnny and Dukey borrow it to create a whole world of adventure!" Then: "Cyborg and Beast Boy face off about which is better, burgers or burritos." Also on TV tonight: The midseason finale of Doomsday Preppers on National Geographic at 9 PM. Syfy has new episodes of Face/Off and that cosplay show. The final ever episode. For real? Let's hope not. Check out a clip above, via IGN, in which Fry and Leela discover they're the only ones moving in the entire universe. And it sounds like this could be a traumatic episode for Leela fans, judging from the synopsis of the first Act over at the Infosphere. 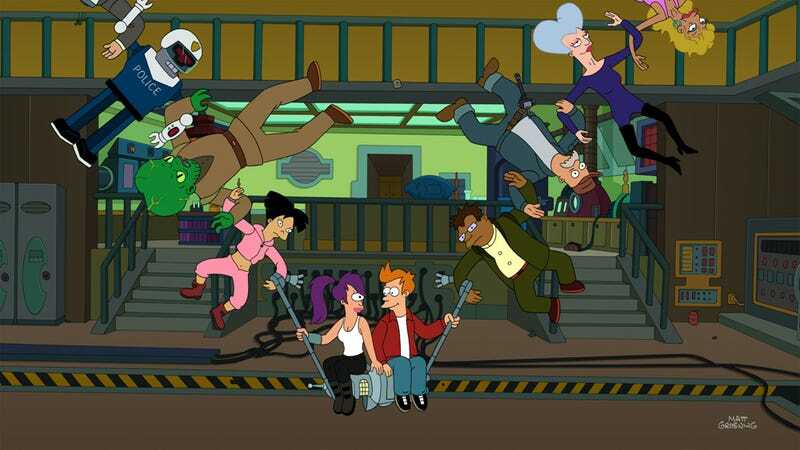 In any case, we know there's going to be a Simpsons/Futurama crossover next year, so this isn't the last we're seeing of the Planet Express crew. Digits crossed! Also on TV tonight: There's a new Yoda: The LEGO Chronicles on Cartoon Network at 8 PM. Also at 8: the first episode of a new show about archeology called DigFellas on the Travel Channel. At 9 PM: a new Ghost Mine on Syfy, and a new Unexplained Files on Science. At 10 PM, there's a new FanAddicts! On Reelz, focusing on Star Trek. I have a feeling this TV movie may be offensive to, well, human beings. In any case, count the "redneck" cliches in the following plot synopsis: "Contaminated moonshine dumped in a Louisiana swamp turns the bayou's gators (and the people who eat them) into deadly mutants. The movie stars Victor Webster (Continuum) and Jordan Hinson (Eureka)." Oh, Carlos. You didn't have to do this. Also on TV tonight: A new Burn Notice on USA at 9 PM, plus a new Mysteries at the Museum on Travel. And the season finale of Wilfred on FX at 10 PM. And a new NTSF:SD:SUV on Adult Swim at 12:15 AM. A second helping of Chiller's series where paranormal investigators examine the true stories behind horror movies. This time around: The Haunting in Connecticut, The Blair Witch Project, Fire in the Sky, and A Nightmare on Elm Street. Also on TV tonight: Nickelodeon finally airs the long-delayed Monster High: Friday Night Fights, which was supposed to air in 2012 and has been out on DVD for a while. Bruce finally shares his secret identity with his sidekick. Surprised it happened this soon, given his trust issues. "Bethanie Ravencroft lures Bruce to the Argus Club in an attempt to steal the Soultaker Sword; Katana rescues him and Bruce reveals that he is Batman." Also on TV today: The Hub apparently has a new Pound Puppies at 9:30 AM, and a new She-Zow at 12:30 PM. Nickelodeon has a new Power Rangers at 1 PM, followed by Digimon Fusion. Disney XD has a new Slugterra at 10 PM. This time around, "Things heat up for Walt in unexpected ways." Maybe this promo has a few more clues. Also on TV today: There are new episodes of Yu-Gi-Oh! on Nicktoons at 11 AM. At 9 PM, there's a new Dexter on Showtime. Also at 9 PM: the season finale of Unforgettable on CBS. At midnight, there's a new Aqua Teen Hunger Force on Adult Swim.